Math can be exciting and challenging at the same time for all grade levels. Let us model how to teach collaboratively using research based, high yield strategies for closing performance gaps while building student self efficacy to maximize student test scores. Many students find themselves years behind their peers. With dozens of students at varying levels of ability, teachers struggle to differentiate. Our workshops align concepts to build teacher capacity and model how to close performance gaps quickly and efficiently. Struggling to understand material can make students feel isolated and frustrated. Our workshops are designed to boost collaboration between participants, modeling an ideal learning environment to build student confidence in their abilities and promote inclusion. Here at Access Curriculum Together (ACT), we are two specialists with decades of experience teaching math and special education who personally understand the unique challenges facing teachers with both: a shortage of resources and a lack of integration. We desire to see educators united with resources and strategies that maximize students’ enjoyment of learning and capacity for success. By connecting administrators and teachers with the latest research and rigorous, hands-on solutions, we can ignite a passion in all students to learn. We believe excellence in mathematics is not only for a select group of students, and that special education students shouldn’t be isolated from the rest of the school population. When all students feel successful and discover their potential, the resulting joy will help mold them into indispensible future leaders in their communities. By equipping school districts, campuses, teachers, and paraprofessionals with innovative tools and resources, we can close performance gaps and help all students feel confident in their academic abilities. We fully support schools implementing ACT’s workshops and resources, where every student belongs, where every student succeeds. We are proud to share our successes with you. Every low performing and high performing school district we have served has been positively impacted by ACT and has Met Academic Standards!! Contact us to see how we can positively impact teachers, students, and scores! 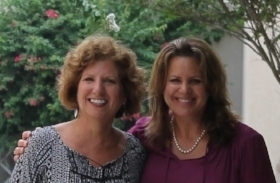 Kimberly Cook and Patty Callaway partnering for your success!